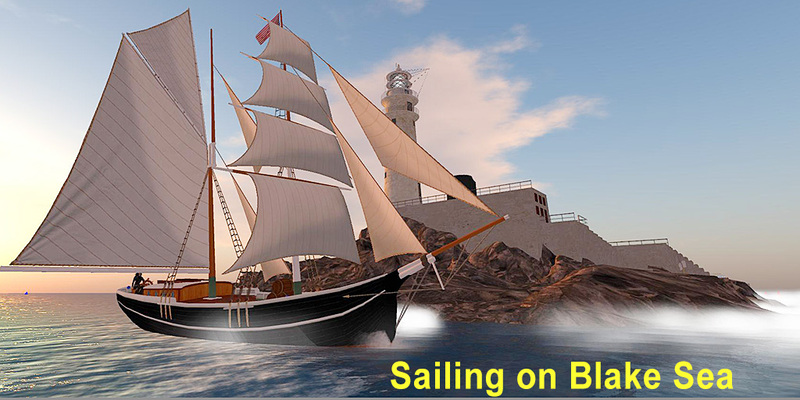 If you sail often in SecondLife you may opt for parking your boat in a harbour or marina. It looks more real and you can easier access your boat rather than every time finding a place to rezz and dig into your inventory. Once you booked a slip in a marina, it quickly becomes a kind of home base. Its where you go to start exploring the world, call it the Columbus syndrome. 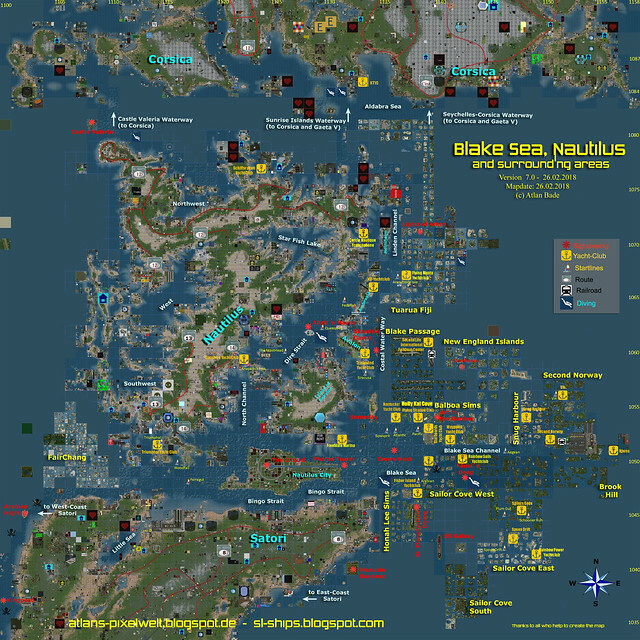 There are many marinas in SecondLife, these below are a few of the more popular ones in Blake Sea connected areas to help you make a choice. Visit them before you decide, they are all very different in theme, location, cost and size and some may suit you better than others. Once you have decided, look for a free slip to rent. if none is available ask to be put on a waiting list. Some marinas have automated waiting lists which inform you the moment a slip becomes available. Get acquainted with the mechanics of a marina and talk to people who already are renters or the owner to get some background. Depending on the type of boat you like to park you need the right amount of prims. But prims cost money. In the old days every boat was maximum 32 prims for technical reasons. So many marinas still use that amount as maximum. Prices depend on location and prim amount. Most use 3L per prim per week as a base tariff, so a 32 prim slip will cost around 96L a week, but with bigger boats the cost per prim is usually lower. You can also decide to rent a parcel in an area with access to sailing space like Sailors Cove, Little Norway, Fruit Islands or Hollywood. Its of course more expensive than not connected regions, but you can park all your boats and live there. These places are very popular these days and finding a good spot may take some time. Looking at the map for land for sale in these areas is often without success since the map only shows land-for-sale after some time and often its already taken. Better is to join a rental group and receive their availability updates like Sailors Cove does. TIP: if you rent a slip in a marina, but you have multiple boats, then its quite easy to have them all available by using a rezzer. You install a small prim which contains a rezzer script and in this way you can easily rezz any of your boats quickly and exactly in the right spot. Its only one prim, so its not adding much. I even use it to temp rezz a boat which has more prims than permitted, but since you don’t really park it and immediately sit on it to go sailing you are not violating any rental agreement. I even use this to rezz my planes and choppers. A very good product you find here on MP, only 100L and you can add 6 boats per rezzer. SL consists of mainly two types of land. The privately owned regions and the so-called mainland. Mainland consists of 8 or 9 main large areas. Some of these areas are connected to the Blake Sea. Nautilus City to the north/west, Corsica and Gaeta to the north and Satori to the south/west. Satori is less interesting when it comes to sailing because there is little water. On top of that a number of privately owned estates with hundreds of regions which are connected to this Blake Sea. Hollywood Balboa regions connected to the north, Honah Lee regions to the south and more to the east the estates Sailors Cove West and East, Second Norway, New England Islands, Brook Hill and a beautiful rain forest in Sailor Cove South. The combination of Blake Sea and the connected estates makes a large connected area which can be used for all sorts of sailing or flying. Rezzing your boat in BS can be done in many places. Actually not long ago LL added a small corner to every region of their BS regions where rezzing your boat is possible. If you look on your minimap you can see these small parcels. In Blake Sea LL created several island with rezzing possibilities. You have to go the right spot on the island because only small areas can be used to rezz your boat. Here are listed a few.